St. Martin of Braga ca. 6th cent. Now you say: “The triple invocation of the name and the triple immersion is certainly Arian.” Here is my answer: to be immersed thrice in the single name of the Father and of the Son and of the Holy Ghost is an ancient and apostolic tradition, which the priests of this province possess in written form on the authority of the Bishop of Rome. This same custom was observed at Pascha by the Bishop of Constantinople in the presence of delegates appointed from this kingdom to the imperial court. We have also read the letter of blessed Paul the Apostle, in which it is written: “one Lord, one Faith, one Baptism:” and the exposition of blessed Jerome, in which he confirms that they are to be immersed thrice with the invocation of the single name. If yuou wish to see it, you will find the book itself, written on papyrus and very old, in the possession of our venerable and holy brothe the priest, Ausentius. Likewise, in the “Acts of Saint Silvester” warning was given to Constantine in a vision and he was commanded to be immersed three times. 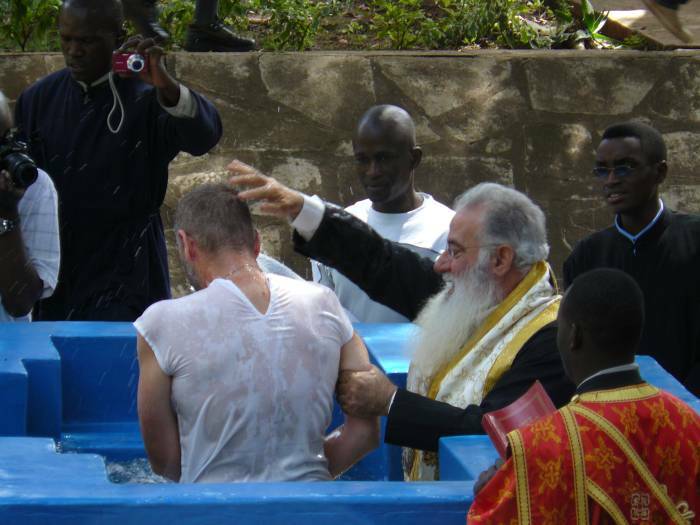 Many, hearing the words of the Apostle: “one baptism,” have tried to understand this as referring to a single immersion rather than to the unity of the Catholic Faith in this, that baptism everywhere should be celebrated in a single manner. Then, in attempting to avoid approaching the custom of the Arians, who also immerse three times but in a single name, as we do, they cahnged the formula of the ancient tradition so that there should be a single immersion under a single name, not realizing that the unity of the substance is revealed in the single Name, but the distinction of the Three Persons in the triple immersion, so that–just as we believe in all truth–we demonstrate the Single Substance but the Three Persons of the Godhead. for if there is a single immersion under a single name, then only the Unity of the Deity in the Father and the Son and the Holy Ghost is demonstrated, but no difference of Persons is shown. Yet my bishop (Antiochian) is requiring me to enter by Christmation only???? Lol. Canadian, you did a great job communicating how vexed you are. Personally, with all the ecclesiological heresies in the air I favor baptism for converts so as to emphatically state belief in one, holy, catholic and apostolic Church. I was accepted by chrismation as well and I felt just like you do now. Once on a time then, Agripinnus, bishop of Carthage, of venerable memory, held the doctrine— and he was the first who held it— that Baptism ought to be repeated, contrary to the divine canon, contrary to the rule of the universal Church, contrary to the customs and institutions of our ancestors. This innovation drew after it such an amount of evil, that it not only gave an example of sacrilege to heretics of all sorts, but proved an occasion of error to certain Catholics even. Check these links out. They go into how the Church has accepted western converts throughout the last millenium. St. Vincent of Lerins is wrong, right? The West (excluding the North Africans) had a tradition not to baptize Trinitarian converts. St. Vincent takes Pope St. Stephen’s (I.e. Rome’s) side over St. Cyprian’s. The Church has incorporated both traditions in different times.